Louis Janmot (1814–1892), The Golden Stairs (Poem of the Soul 12) (1854), oil on panel, dimensions not known, Musée des Beaux-Arts, Lyon, France. Courtesy of Musée des Beaux-Arts, via Wikimedia Commons. 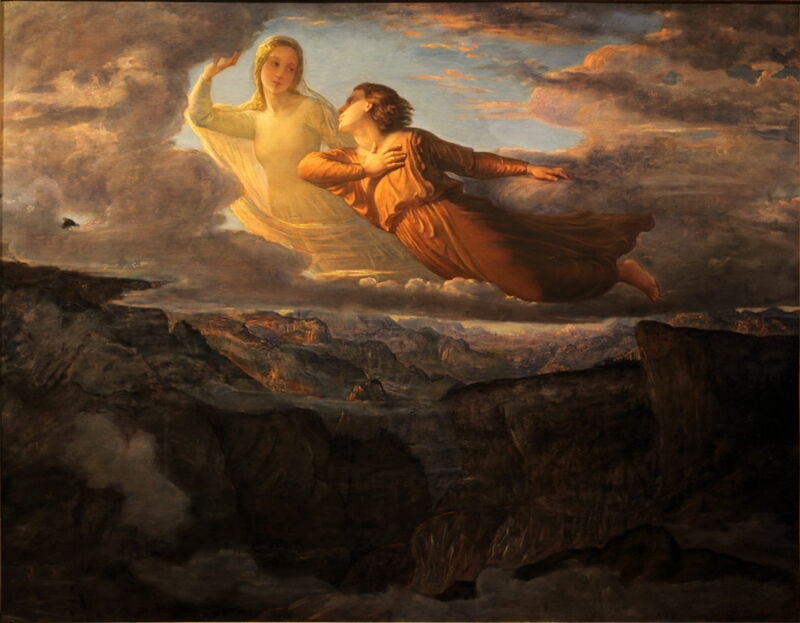 This article concludes my account of the series of eighteen oil paintings which make up the first part of Louis Janmot‘s epic Poem of the Soul, in the Musée des Beaux-Arts, Lyon, France. 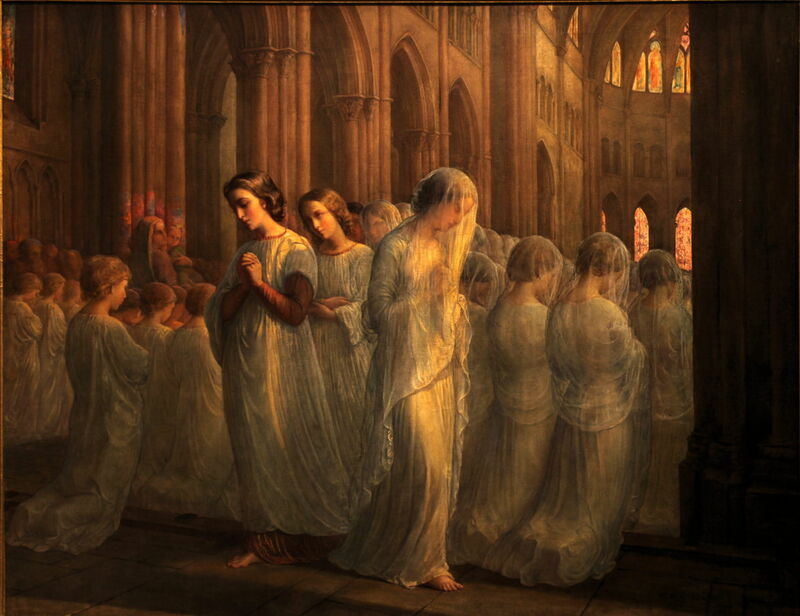 Louis Janmot (1814–1892), First Communion (Poem of the Soul 10) (1854), oil on panel, dimensions not known, Musée des Beaux-Arts, Lyon, France. Courtesy of Musée des Beaux-Arts, via Wikimedia Commons. The pair are seen attending their first Holy Communion, which takes place in the nave of the Cathedral of Saint-Jean de Lyon. They are seen in the company of many other young people who are also receiving their first Communion, in a scene lit to emphasise the spiritual importance, with small pools of rich colours where the sunlight has passed through the stained glass windows. 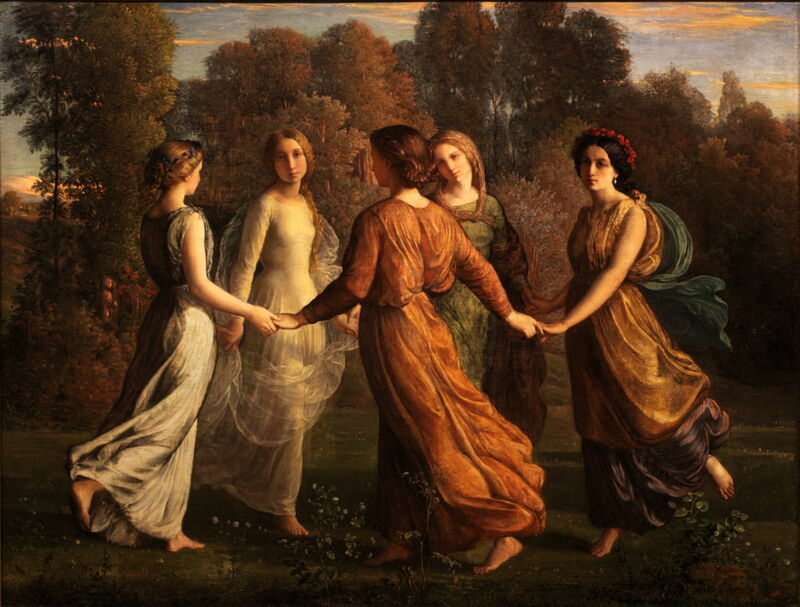 Louis Janmot (1814–1892), Virginitas (Poem of the Soul 11) (1854), oil on panel, dimensions not known, Musée des Beaux-Arts, Lyon, France. Courtesy of Musée des Beaux-Arts, via Wikimedia Commons. Still dressed in their gowns from church, the two sit together by a pond, with high mountain peaks in the distance. The boy is stroking a dove, a symbol of peace, while the girl strokes a panther, indicating tamed passions. They both hold a lily, for purity, which separates and unifies them. 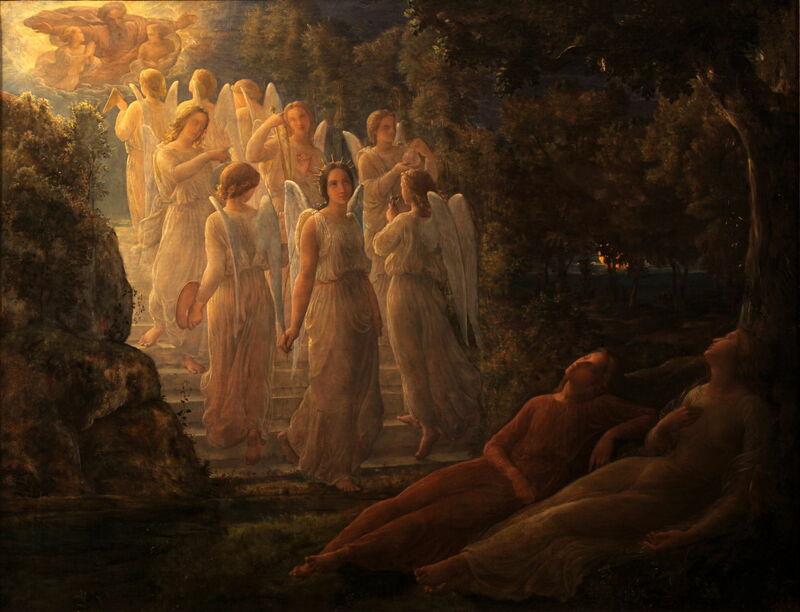 In a revisit of Jacob’s Ladder, the pair fall asleep in the woods, and dream of a perpetual cycle of nine angels ascending and descending a staircase which leads towards God in heaven. The angels each carry a symbol of the arts, such as a musical instrument. 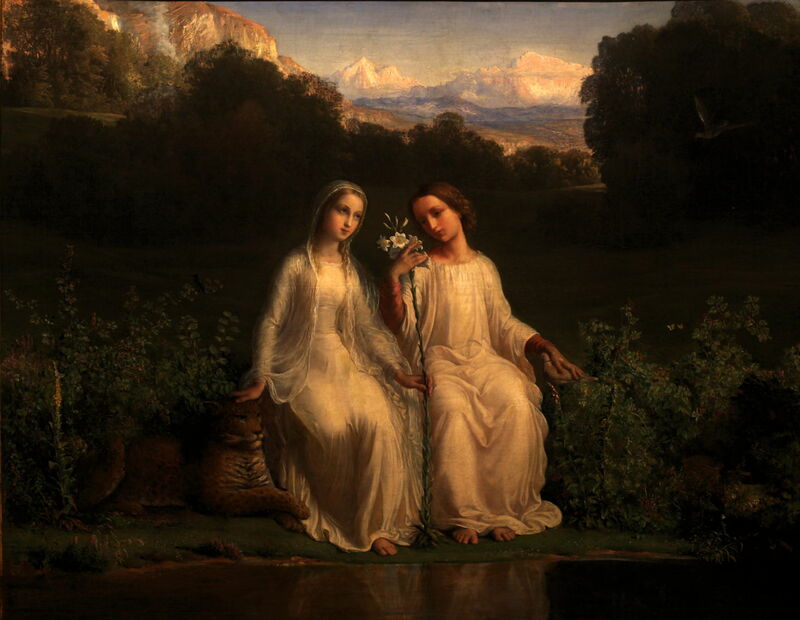 Louis Janmot (1814–1892), Sunrays (Poem of the Soul 13) (1854), oil on panel, dimensions not known, Musée des Beaux-Arts, Lyon, France. Courtesy of Musée des Beaux-Arts, via Wikimedia Commons. In the early autumn, the two join with three other young people in a dance, strongly reminiscent of Poussin’s Dance to the Music of Time (c 1634-6). Signifying the passing of time and the rites of early adulthood, the young woman looks directly at the viewer. 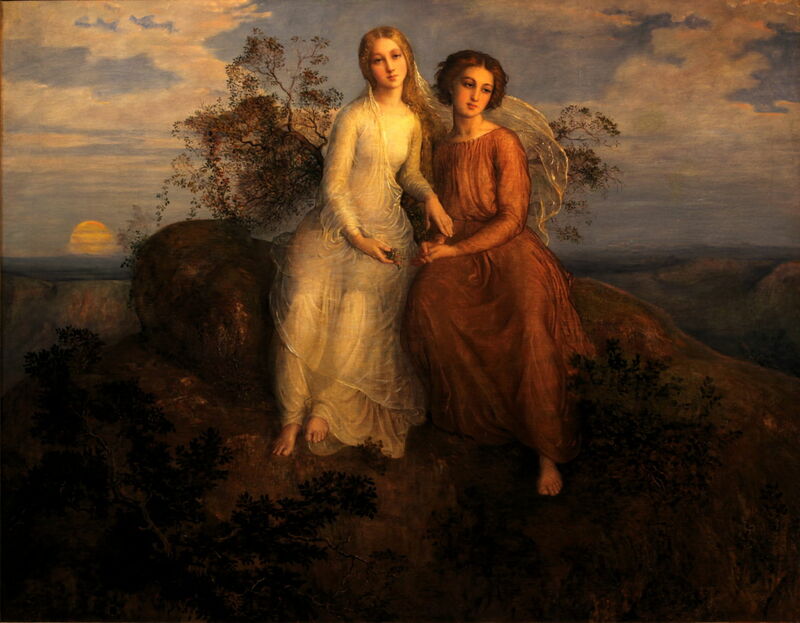 Louis Janmot (1814–1892), On the Mountain (Poem of the Soul 14) (1854), oil on panel, dimensions not known, Musée des Beaux-Arts, Lyon, France. Courtesy of Musée des Beaux-Arts, via Wikimedia Commons. The couple now undertake life’s challenges, symbolised by the ascent of a mountain, a task they accomplish together. So they achieve the ideals of life, both earthly and spiritual. This also indicates their exploration of space, and the world in which they live. 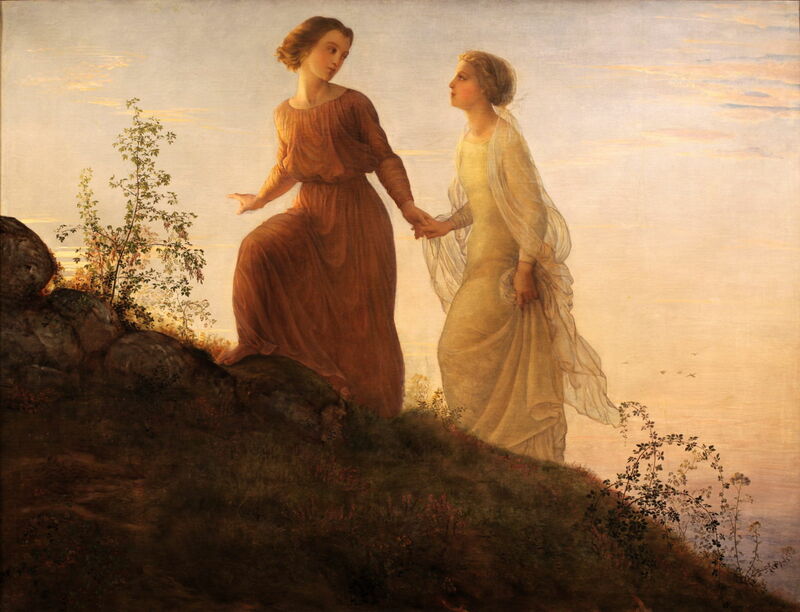 Louis Janmot (1814–1892), One Evening (Poem of the Soul 15) (1854), oil on panel, dimensions not known, Musée des Beaux-Arts, Lyon, France. Courtesy of Musée des Beaux-Arts, via Wikimedia Commons. Having made their ascent, the pair are seen on the summit, as the sun sets behind them. This peak also marks their transition from adolescence to adulthood. 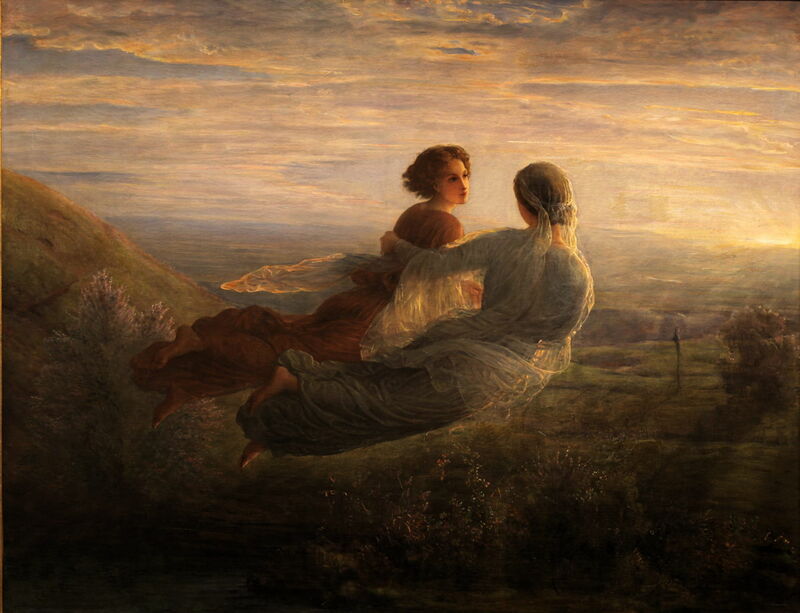 Louis Janmot (1814–1892), The Flight of the Soul (Poem of the Soul 16) (1854), oil on panel, dimensions not known, Musée des Beaux-Arts, Lyon, France. Courtesy of Musée des Beaux-Arts, via Wikimedia Commons. From the summit, the soul (young woman) takes the young man on a flight over the plains below, where the country is less attractive than they might wish. Looking at one another, they give themselves strength in their unity. Louis Janmot (1814–1892), The Ideal (Poem of the Soul 17) (1854), oil on panel, dimensions not known, Musée des Beaux-Arts, Lyon, France. Courtesy of Musée des Beaux-Arts, via Wikimedia Commons. They now near the zenith of their flight, and the young woman (soul) parts the clouds towards heaven. The young man says that he trembles with joy but also feels a wave of fear. She bids him farewell, telling him that where she is going (to heaven), he cannot follow. Louis Janmot (1814–1892), Reality (Poem of the Soul 18) (1854), oil on panel, dimensions not known, Musée des Beaux-Arts, Lyon, France. Courtesy of Musée des Beaux-Arts, via Wikimedia Commons. 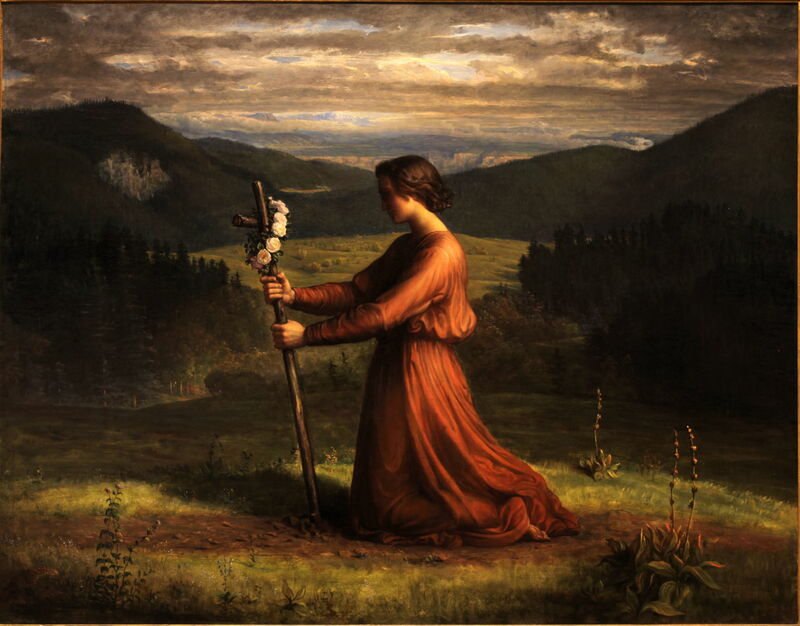 Now a man, returned to earth alone, his spirit back in heaven, he kneels before a wooden cross decorated with a garland of flowers which she left him. (It is said that this refers back to flowers which she wore at their First Communion, but no such flowers appear in the paintings.) He pines for her memory, as breaks in the cloud cast bright sunlight down on patches of the earth. Janmot’s story continues in the charcoal drawings which I will show in the next article in this series. Posted in General, Painting and tagged Blake, Janmot, narrative, painting, Poussin, Redon, series. Bookmark the permalink.